Signs similar to the one depicted above have been seen with the wording in English, Portuguese and Spanish. An important aspect of the type of advertising that Collins participated in was the use of signs. 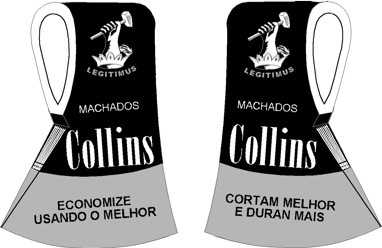 For some reason as yet to be properly explained, Collins seems to have utilized more signs that included wording in Spanish and Portuguese than those that have survived in English. Some of the signs include wording in both Spanish and Portuguese while others included a mixture of words in both languages. Some of those word combinations have resulted in difficulty for individuals who speak and read both languages. It has been suggested that the wording may have resulted from the sign designers not having a through understanding of the languages or perhaps it was an attempt to provide enough wording in both languages as to be able to convey the intended messages. 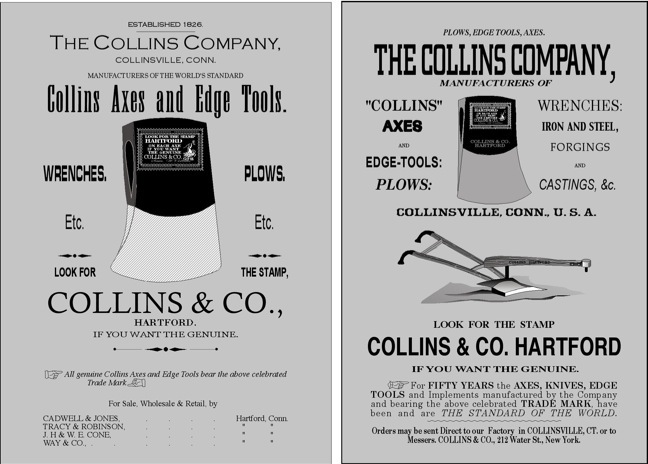 Whatever the case there are signs that advertise Collins implements and edge tools that are usually on either just a rectangular sign or on a sign shaped like an axe head. Some signs are printed on heavy pasteboard. Others are made of metal and painted while still others were made as "porcelain" signs. Porcelain sins have the background and wording applied as a glass based finish that is actually fused to the metal backing. This method of finishing resulted in durable, long lasting signs that could be installed outdoors. Those signs that were shaped like axe heads had the advantage of advertising by shape recognition as did the signs with embossed areas in the shapes of other edge tools. Machetes and plows were two of the edge tool types that were frequently depicted. It was rather commonplace in some areas that the majority of people were illiterate so shape recognition went a long way to help communicate the availability of goods in some areas. Representation of a metal sign. Photo of a pasteboard sign. More detailed metal signs were printed on a metal sheet sometimes with slightly raised areas. Signs such as these were printed on heavy card stock and sheet metal and then stamped from the back resulting in an raised effect for some areas and/or letters. Signs like this were printed and embossed on sheet metal. The actual colors were ivory white and deep blue. Marketing techniques used by retailers often involved the use of what are referred to as String Tags. 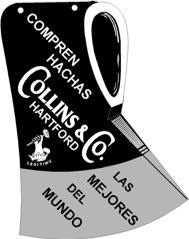 One type of string tag that was used on Collins goods included a metal ring while another was printed in color. It is assumed that both have provisions on the back for indicating the price and possibly a stock number or product name. These two pieces of information would be entered onto the back of the string tag as needed thus reducing the necessity to have a string tag for each product. 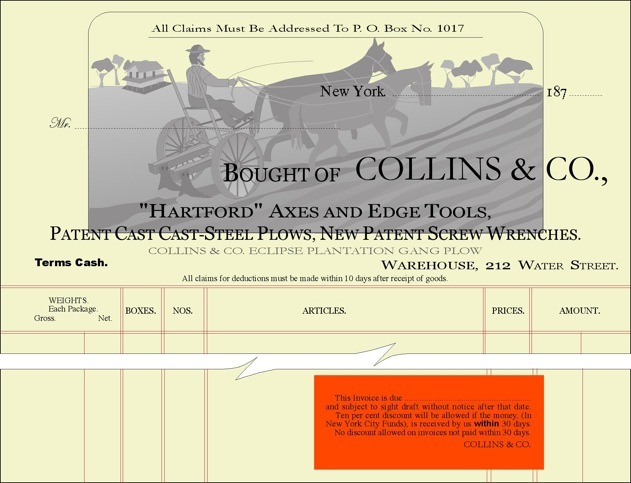 At one time it was possible to ship certain tools and hardware items by filling out a shipping tag and affixing it to the product. Shipping tags were commonly used by companies that moved such items and classified it as freight. In some cases such shipping labels were even acceptable for use on items being shipped via the US Postal Service. The items were not considered first class mail so the use of postage stamps was not involved. The procedure involved taking the item to the shipping office which may have just been a specific counter or area of a store, having the item weighted, paying the fee and having the tag stamped by the agent. It is understood that this method of shipping was relatively inexpensive but it could be time consuming. Pickups were not necessarily on a regular basis and the goods were not necessarily guaranteed a place on the transport vehicle so delivery time varied considerably. Private shipping concerns also accepted goods to be shipped in a similar manner and it is understood that delivery was based on when the shipping company had enough material to be transported along a given route. In some cases the tag was affixed by twisting a wire around part of the item or even through a hole in the item. Other tags were tied to the heavy pasteboard tag. Signs like this were finished on both sides for exterior use. A very popular means of advertising for many companies was the use of a customized letterhead and/or billhead. Other types of stationery included company envelopes and even postcards that had advertising printed on them so anyone exposed to any of those forms of stationery would have visual exposure to the advertising. Such printed matter was a means of show-casing information related to a company such as location or locations, principals involved, product lines and financial terms. All of the above information was not necessarily included as part of each form of stationery but in some cases it was and in many cases decorative graphics were included to catch the viewer’s eye. The combination of the various components also provided a company the opportunity to show that it was substantial enough to warrant the use of such stationery. Facsimile of the "back" side of a standard size post card intended to be used as the area in which the message was written. It may be that such cards were intended to be used for company business. 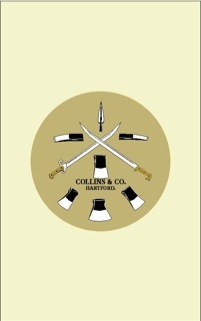 Facsimile of a Collins Co. letterhead used by The Collins Company, ca. 1929. Similar letterheads showed the area in red printed in black. Facsimile of a Collins billhead, part of the bill form with a stick-on reminder used in the 1870s. 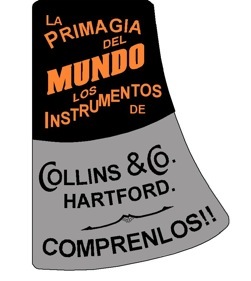 There are numerous indications that Collins realized the advantages of advertising quite early in their history. Initially they provided advertisements in City and Business Directories which at the time were primarily in words only. That was because graphics were not readily available during Collins's early years. As time went on Collins did add graphics to their ads, some of which were quite detailed. 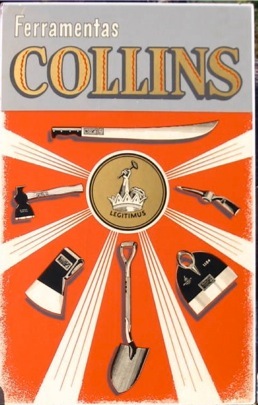 Like many companies, Collins engaged in placing a wide variety of advertisements in magazines and directories. 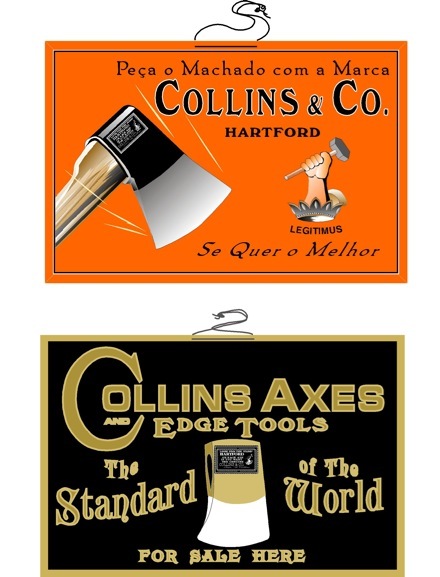 The ads depicted indicates the diversity of the product lines Collins & Co. offered. Note the inclusion of Wrenches and Plows in addition to Axes and Other Edge Tools. 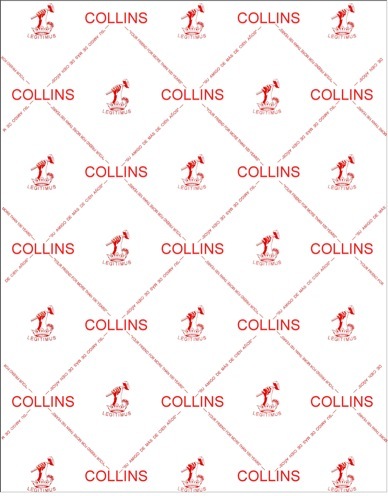 Facsimile of the design used on sheets of heavy waxed-type paper used by Collins. Signs like these were printed on embossed sheet metal. They measured approximately 10 inches wide. They could be hung from a string or nailed up. Signs like this were printed on heavy card stock, approximately 10 inches wide and included a string for hanging. 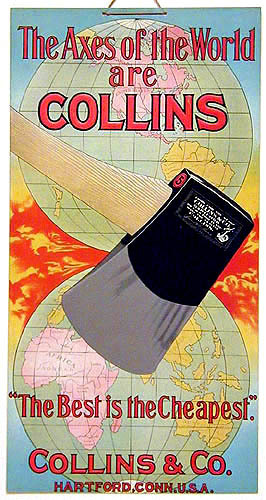 The Collins Co. exported a considerable amount of tools and edged implements to locations throughout the world. Most of that exportation was done via ship and then rail. Climatic conditions related to humidity and dampness could cause quite a bit of discoloration and even damage to goods. One means of combating such problems was to individually wrap the metal components of each item intended for export in a treated paper. It is understood that the paper was sometimes printed first and then treated with wax. Such paper was intended to reduce oxidation so the wrapped items were then packed in cases. Based on the design of the paper depicted it is obvious that the example was used after 1876. Signs like this were made of sheet metal. The example shown was copyrighted in 1900 by The Collins Co., made by a manufacturer in Coshocton, Ohio and displayed in many countries where machetes were used in abundance. Some string tags were printed in black on a white background. Others were more colorful. Some had space on the back for prices. Some shipping tags were tied on, Others had wire instead of string.